?addentry How old are you? ?addentry Why should we accept you? 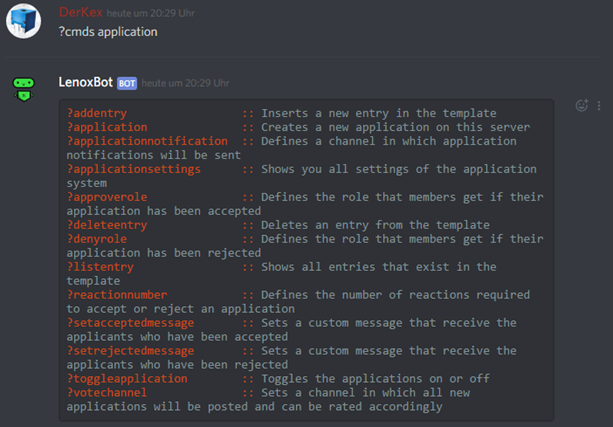 ?application: With this Command, all Discord users can apply (It doesn't matter in which channel, expect you've add the command to a blacklisted channel). ?applicationnotification: With this Command, you can define a channel, in which the Notifications for new Applications are posted. You can also cancel the channel with this command. ?applicationsettings: With this Command, you can see all settings you’ve made. ?deleteentry: With this Command, you can delete Entries, which you have addeded. ?listentry: With this Command, you can see all Entries, you’ve addeded. ?setacceptedmessage: With this Command, you can set a Message, which accepted Applicants will get (also at Dashboard). ?setrejectedmessage: With this Command, you can set a Message, which rejected Applicants will get (also at Dashboard). ?toggleapplication: With this Command, you can toggle the Applications On/Off (also at Dashboard). How can you apply now and how does the process take place? If you have set up everything on the Discord server (or Dashboard), there won't be anything in your way! The user can use the commmand ?application in a channel in which he has the permissions to write and a new application form will be created. After that, he will be asked every question one by one and has to answer to them. Otherwise, his application won't be sent. Then, the questions and answers can be shown at the website, the Link to the Application is in the Notification Chanel. There the application have two Buttons; with the first one, the application can be accepted and with the second one it can be denied. In case of an accepted application, the user will get the the role that was already defined before. That’s it, now go and change the world with your applications.